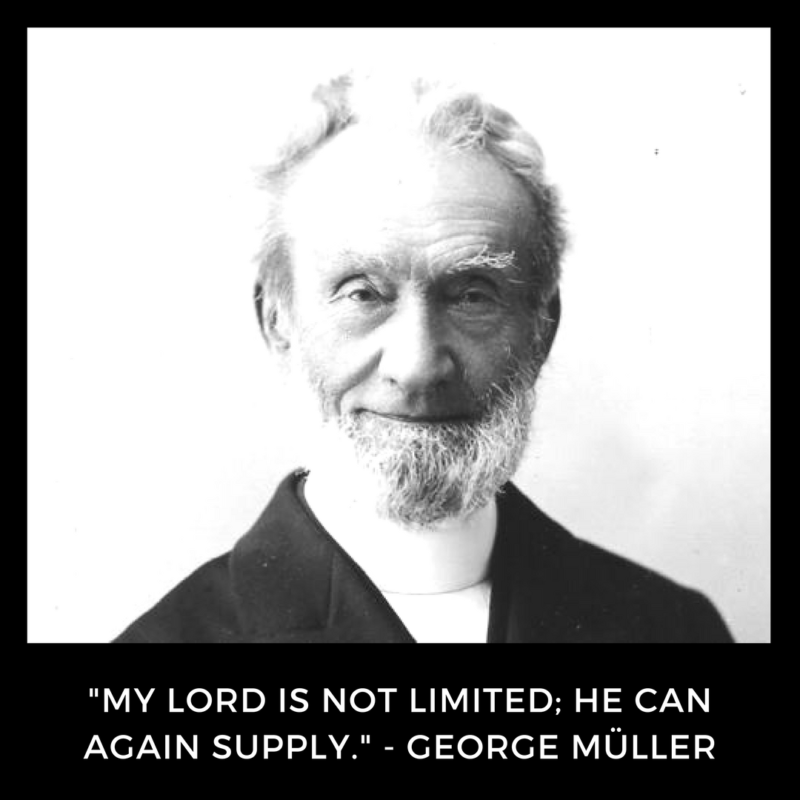 George Müller is remembered today for his great faith and mountain-moving prayers. He didn’t begin life as the saint he is known as today, though. Quite the opposite, in fact. Up until partway through his university years, he was a thief, a gambler, and a liar. In fact, the only reason he had agreed to follow his father’s wishes and study to become a Lutheran pastor was because he loved the idea of an entire congregation of gullible people he could scam. Everything changed when he agreed to go with a friend to a Bible meeting, though only to get a few good stories to tell at the alehouse. The meeting did more than give him a few stories, though. It changed his life. The sincerity of the worship and the passion with which the leader read the sermon amazed him. He left wanting more. Through the next several years, studied the Bible and prayed as often as he could. Gone were the days of partying and gambling. During his time at the university, he preached his first sermon at a small rural church. He prepared every detail, crafting an elegant sermon full of big words, big ideas, and many quotations of respected books. To his surprise though, he was met with comments about how nobody had understood a word he said. After spending some time praying, he decided to preach an entirely new sermon for the second service. From then on, he would quote only from the Bible, and keep his message simple and pure. Turning to Matthew 5, he preached on the subject of “Blessed are the poor in spirit.” This experience would guide him in his simple faith for the rest of his life. After George finished school, he moved to London to train to become a missionary to the Jews in Europe. Before he left though, he was struck with a sudden, near-fatal illness that would come back to haunt him throughout the rest of his life. Through much prayer though, he was eventually well enough to travel to London. After studying for only two months though, the illness came back. The doctor advised he travel to a better climate, so George moved to Teignmouth in southern England, intending to stay for only a few months. While he was there, he met a Scotsman named Henry Craik who had a very similar story to his own. He stayed for only ten days, but even when he returned to London, he was inspired by the stories of a missionary named Anthony Groves that Henry told him. He decided to not wait until he was in Europe to preach to the Jews. There were Jews right there in London, so he took to the streets, preaching and reading the Bible for anyone who would listen. Something bothered him, though. As he preached to the Jews, thousands of non-Jews passed right by. They needed the Gospel too. George wanted to preach not only to Jews but to anyone who would listen. Soon, he left the organization he had been studying with, heading back to Teignmouth. In only twelve weeks, he found himself as the pastor of Ebenezer Chapel. Two years from then, several major changes had come in George’s life. He was now married to Mary Groves, sister of the missionary he had heard so much about from his trusted friend Henry. He had a baby on the way, and he was moving to Bristol. As much as he had loved preaching to the people of Teignmouth, and as much good as he had brought about there, he had to move. The people of Bristol desperately needed the Gospel, and he felt that God was calling him there. He and Henry became the joint pastors of Gideon and Bethesda Chapels. There, he ministered to everyone he met, praying regularly over people as a cholera outbreak tore through the dirty, crowded city. One particular group of people tugged at his heart. The children. The number of orphans in Bristol was higher than ever, with many children losing both parents to cholera. George started a little breakfast club at his house to help feed and preach the gospel to these needy children. Over the course of many years, this developed into his life’s work. First, he started one orphanage, then he bought another, then another until he had five buildings in the same street. Eventually, those got too full to be practical, especially for being in town, where the children were noisy and used up all the water on the streets, leaving the neighbors grumpy and discontent with the orphanages. After spending some time searching, he found some land at a miraculously low price and built an orphanage large enough to house 300 children. He did all of this without asking anyone for money except God. He relied entirely on prayer to supply all of his needs. Some called him crazy, some called him a saint. He was probably both. He wasn’t content with one orphanage though. Over many years, he built another, and another, until he again had five orphanages, except these each housed roughly 300 children instead of 30. By then, George was getting older and had two children of his own. He had started a school called the Scriptural Knowledge Institution for Home and Abroad, giving a Christian education to 120,000 children. In February of 1870, tragedy struck. After 39 years of marriage, Mary Muller passed away only a week after number five orphan house opened. The funeral service was the largest Bristol had ever seen. Over a year later, George remarried to an old friend, seeing how much his newly-married daughter benefited from a partner in her work, and wanting someone to help him carry on God’s work. He was old now. Gradually, he gave the work of the orphanage and the school to other, younger people, and focused on his preaching. By then, he was known throughout all of England and beyond for his preaching. He was good friends with Hudson Taylor, and through the orphanage met many influential people of his time, including Charles Dickens. He traveled around England, then focused on other countries. He toured America, Europe, Austrailia, and New Zealand, visiting a total of 42 countries by the time he concluded his preaching stint. He was 88 years old by then, yet he still didn’t slow down, throwing himself back into the work of the orphanage and the Scriptural Knowledge Institution. In 1894, George lost his second wife, and he died four years later at the age of 92. He lived a full and impactful life, and the organizations he started are carrying on the work he started to this day. He cared for 10,024 orphans in his life and relied on God to provide for every one of them. There were days when hundreds of orphans stood in front of tables prepared for breakfast with no food on them. God would always provide, whether it was through a generous donation or a milk cart that broke down in front of the orphanage. George Müller and his children never went without food for lack of money. His life is a testament to the strength of our God and His power to provide for His children.